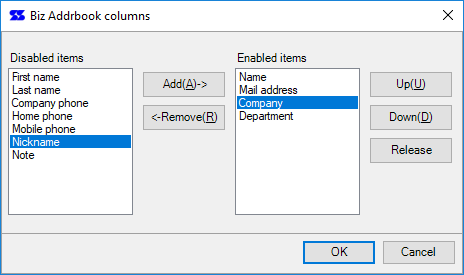 You can customize the display columns of the list view with "Options" on the "Biz Address" tab of the "Home" ribbon menu. 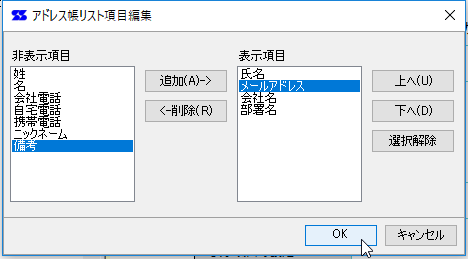 The list on the left side is the non-display item, the right side is the display item, and it is displayed in order from the top on list view. Add the item selected in the hidden item to the end of the display item. Move the item selected in the display item to the end of the hidden item. Move the display item display order to the top (left side in the list view of the Biz Addrbook). Move the display item display order to the low order (to the right in the list view of the Biz Addrbook). You cancels the selection state in the list of hidden items and displayed items.